As you can probably tell, I don't keep up with designer fashion, but once every season or so, I become enamoured of a particular piece. This spring, it was this colorful Marc by Marc Jacobs silk dress. When I saw a similar frock on Ruche, I snatched it up immediately and wore it over the weekend when some friends came over for drinks. Perfect for a summer party! Love it! I was heartbroken when I saw how expensive that Marc by Marc Jacobs dress was a few months ago - I may just have to go buy the Ruche version right now! I love love love that dress!!! /you look so cute in it! I was eyeballing it too! But I don't think it would be flattering on me. You look too cute for words in that dress. I love it and your blog! That dress - the colors, the shape - is really summer perfection. Super adorable! You look lovely! I included this smae dress in one of the inspiration boards I posted on my blog. I simply love it! Oh, that Marc dress! I fell in love with it, too...the price tag? Well, that I don't love too much. 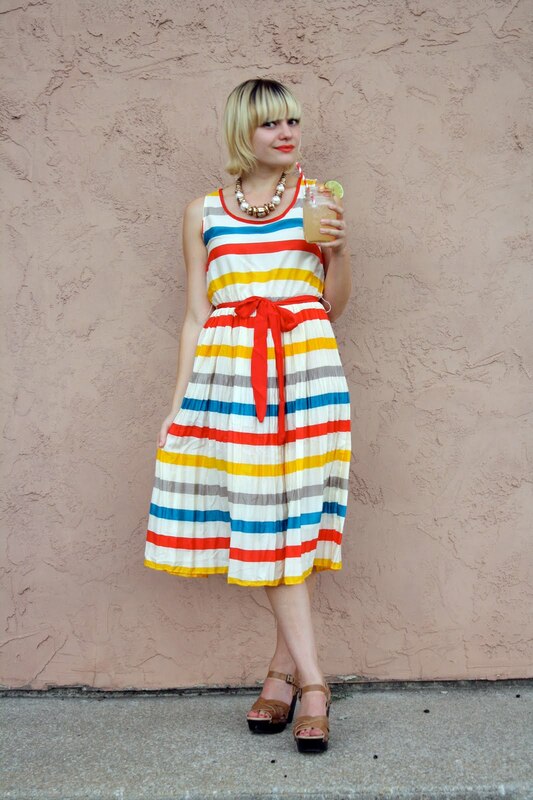 This dress looks amazing on you - such happy stripes! LOVE your dress. I was at a party yesterday were the host was wearing the original Marc dress, super cute, but yours is soooo much cuter and an almost $600 savings!! Love the dress and that necklace is amazing! Perfect ensemble for this heat and cocktails!! LOVE!! i loved that MJ dress, too! i've seen a few shorter versions, but i love the length of yours! great find! oh man you're making me regret taking this out of my shopping cart a couple weeks ago. love the bright colours! What a perfect summertime dress! <3 I love the bright coloured stripes! Gorgeous! I just picked up that same dress last week. So glad I did! WOW! 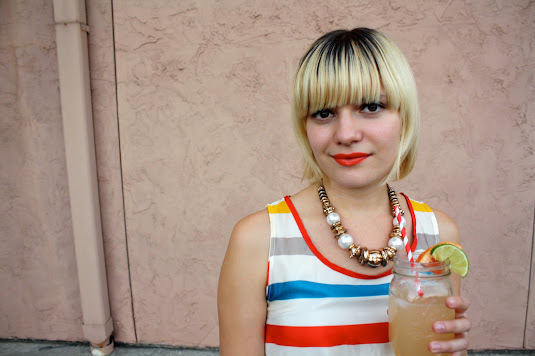 How ironic I was just reading bluebird vintage blog before I flipped over to your lovely little blog and what do I see? This adorable striped dress from Ruche, which I have just entered into a drawing to win in a giveaway Miss James is doing. I love the bright stripes and the easy flow of it…however I am happy to tell you that I think you have styled it much better then Ruche did on their web site! Well done! 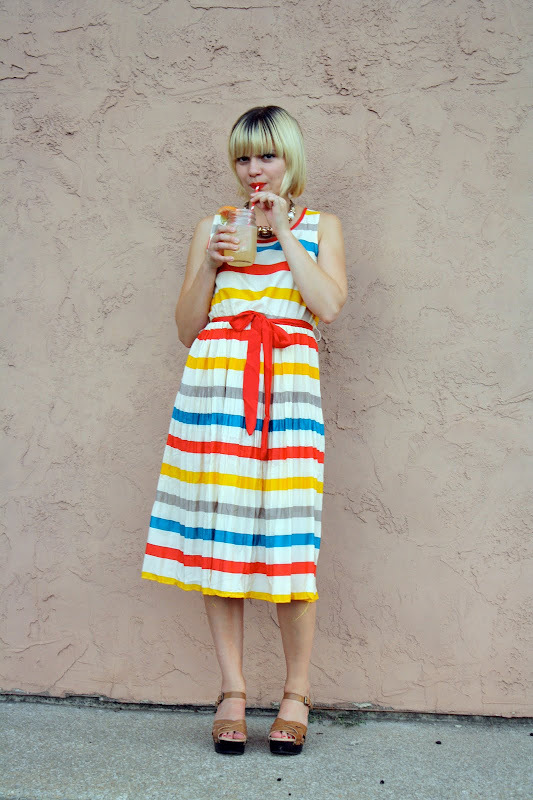 I love this colorful, striped dress! It's so summery and fun!